For some time I have been thinking about implementing a short, possibly corset related, and/or provocative feature at the very start of my home page. Today I have done just that: so check it out. It’s a feature that quotes someone else whose opinion seems particularly relevant to our lives and lifestyles today. It may not be directly related to corseting, but most likely you will find something instructive and possibly helpful in your waist-training efforts. Being raised by a high school teacher who was committed to proper grammar, I appreciate the same when respected by others. I pay particular attention to excellent writing that hits the spot, especially writing regarding health, psychology, and politics today. I’m particularly attentive to pithy comments such as this one concerning social trends, ways, and styles of interacting. The quoted comment represents everything that my business, and I, personally, do not. Corsets and the figures they create are certainly not flat — that much can be said! They can be utilitarian of course; witness my introduction to them to support an injured back until I could heal, now going on almost 50 years ago! Lucy William’s remarkable book Solaced, compiles an amazing variety of first-person account of other benefits that accrue from corseting or waist training. I commend it to anyone doubting the efficacy or healthiness of wearing corsets. Contributors to Lucy’s book are certainly not incoherent nor do they spout nonsense. However as commented above, you might or will see both incoherence and nonsense on social media groups devoted to corseting and waist training, but then, that’s been true for the history of the internet starting with the original chat rooms now seemingly replaced by Twitter and Facebook. Madeline Albright has a new book out on fascism, which I’ve always felt us human beings truly want and must struggle against on a lifelong basis. That is, I observe that at heart humans want the convenience and ease of Mommie or Daddy doing and deciding it for us, and almost living our lives for us so that we don’t have to expend much effort. Not only that, but we want the “experts” telling us what to do. I call it the “Kim Kardashian effect.” I always marveled that Kim discovered “waist training” and “trainers” by herself, and now has become the paragon of popular corseting and figure-shaping virtue, for better or for worse (one could argue my point either way). I also marvel at those who email me over the years, wanting me to “decide for them” what corset to order and how tightly to have the corset close down in the back. Then they want the product delivered yesterday. I’m looking forward to a brand new coaching student, one who is devoted to improving her figure in a way that is healthy, slow, and deliberate, calling upon multiple resources in her quest for these goals. That’s a smart approach to waist training. That’s exactly the approach that Denna followed. 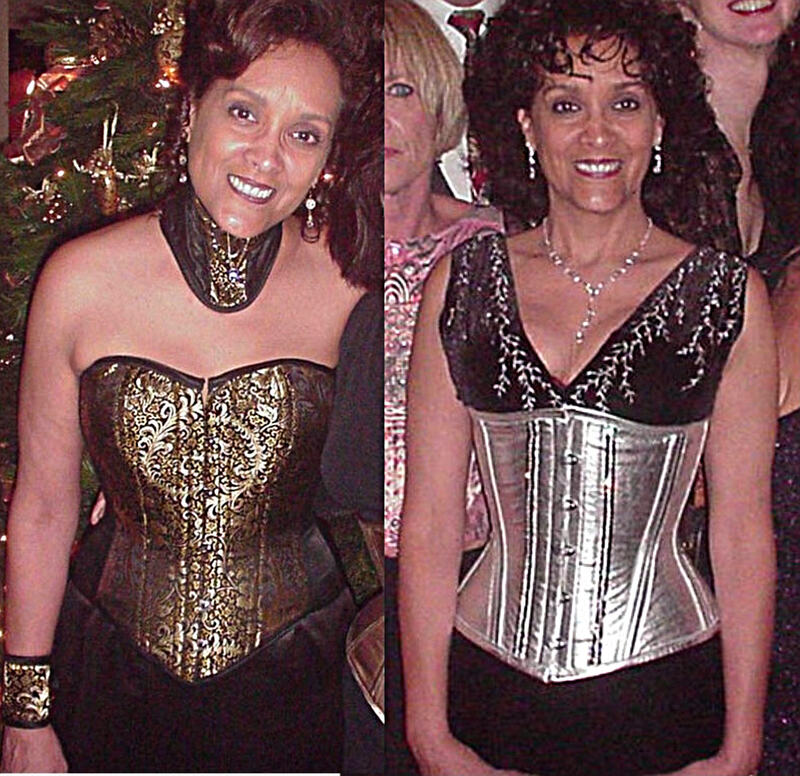 She was one of my first five students many years ago, and is pictured above corseted in “before” and “after” images following three months of waist-training coaching. My new student already has in place a personal trainer/body builder (an educated former corset client of ROMANTASY) who will guide the student on the exercise element of waist training. She will coordinate that workout program with the program I will soon propose regarding corset wear and lacing down, nutrition (food choices and how one eats), and waist-targeted exercising. Because of the student’s detail-oriented advance questioning, reliance on our corsetiere Sheri’s, and my, advice, good communication and response to my initial requests, and seeking detailed information including reading my 250-page book, I surmise that she stands a very good chance of reaching the reasonable waist-training goals we will all set together. I’m frankly excited to help such a student, who comes to the process with her head screwed on rightly, and facing the right direction. We’ll follow soon with her “before” pictures and keep you posted on her progress.